A Renoir painting stolen by the Nazis from a Paris bank vault was returned to its rightful owner Wednesday after a more than 70-year odyssey from South Africa to London, Switzerland and New York. 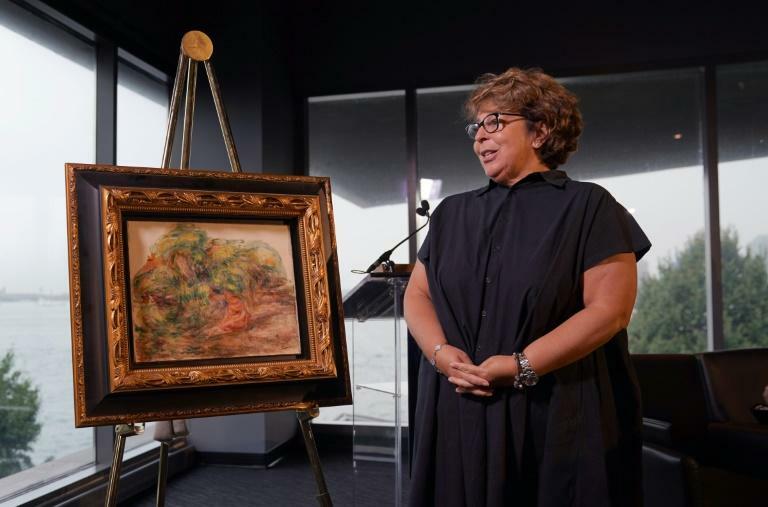 "Deux Femmes Dans Un Jardin," painted in 1919 in the last year of French impressionist Pierre-Auguste Renoir's life, is finally back in the hands of the granddaughter of the Jewish owner who spent decades trying to get it back. Sylvie Sulitzer, the last remaining heir of her grandfather Alfred Weinberger, a prominent art collector in pre-war Paris, received the work from US authorities during a ceremony at the Museum of Jewish Heritage in New York. Although Sulitzer knew her grandfather, she had no idea about the missing Renoir until a German law firm, specialists in recovering art looted by the Nazis from Jewish families, contacted her in the early 2010s. "I'm very thankful to be able to show my beloved family wherever they are that after all they've been through, there is a justice," Sulitzer said. Four other Renoirs and a Delacroix, which her grandfather also owned, have yet to be recovered, she told AFP. The Nazis stole the art in December 1941 from the bank vault where Weinberger stored his collection when he fled Paris at the outset of World War II. After peace returned to Europe, Weinberger spent decades trying to recover his property, registering his claim with French authorities in 1947 and with the Germans in 1958. US officials said the Renoir first resurfaced at an art sale in Johannesburg in 1975, before finding its way to London, where it was sold again in 1977. It was put up for sale again in Zurich, Switzerland, in 1999. But it was only when it was put up for auction by a private collector at Christie's in New York that the auction house called in the FBI. Its previous "owner" eventually agreed to relinquish the picture. It is thought that up to 100,000 works of art, and millions of books, were stolen from French Jews, or Jews who had fled to France before the Nazi occupation began in 1940. The Allies found around 60,000 of the missing artworks after the war in Germany and returned them to France. Two-thirds were returned to their original owners by 1950, according to a French government report seen by AFP earlier this year that criticized French authorities' inefficiency in returning the rest.